always a long 3 1/2 hour drive and there was no way to get there. small towns including Frankfort, Tipton, Elwood and Alexandria. central Indiana we rolled and eventually made it to Muncie. BSU is a nice university and has some pleasant architecture. We dropped Erik off at his dorm, saw his room and took off. Diane showed us her new house...really nice and very roomy. college and met my nephew Henry for dinner at an Indian restaurant. day...a lot of driving...and a nice getaway. I think back to the montage in "Hoosiers" where they start winning and they are traveling by bus to all of the different small towns in Indiana. One of my favorite shots of Americana in all movies. 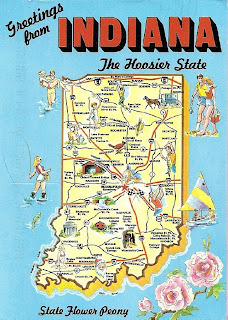 And to a point, Indiana is still like that...H.S. Basketball is king here. Thanks for the "shout out!" Minor point tho' - I retired as a Lt Col.